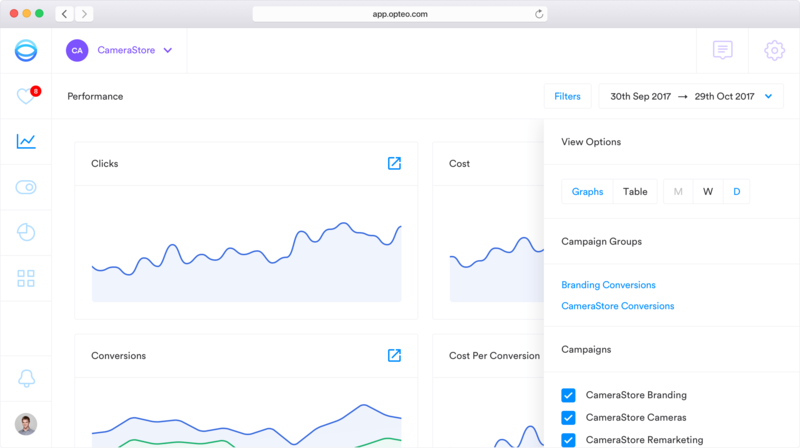 Opteo, the smarter way to manage AdWords accounts. 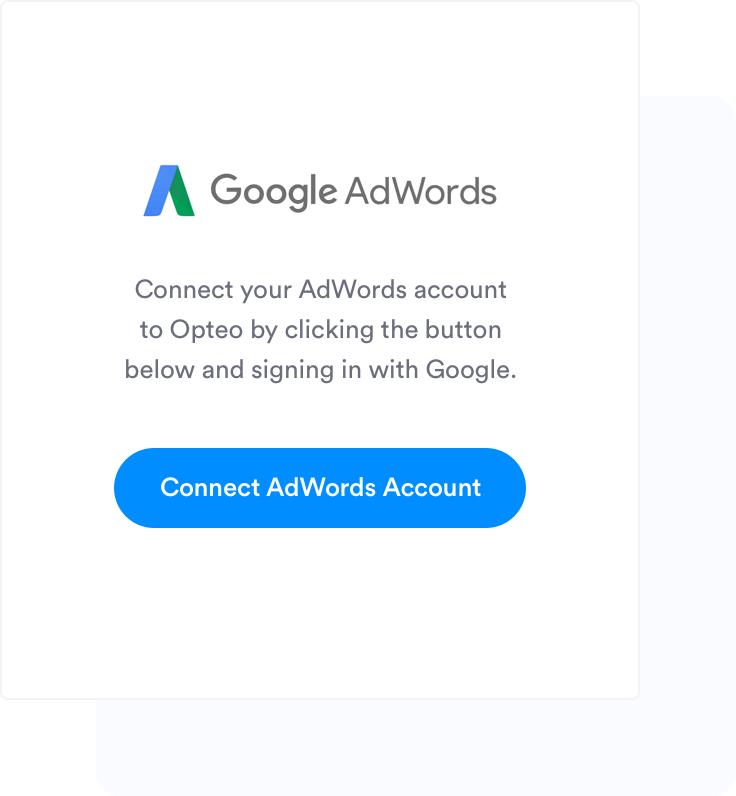 Opteo is everything you hoped AdWords would be. Smart, powerful, and built to make life easier. Automate routine AdWords tasks, spend more time on high-level strategy and creative work. Try Opteo free for 30 days. A complete AdWords management toolkit. 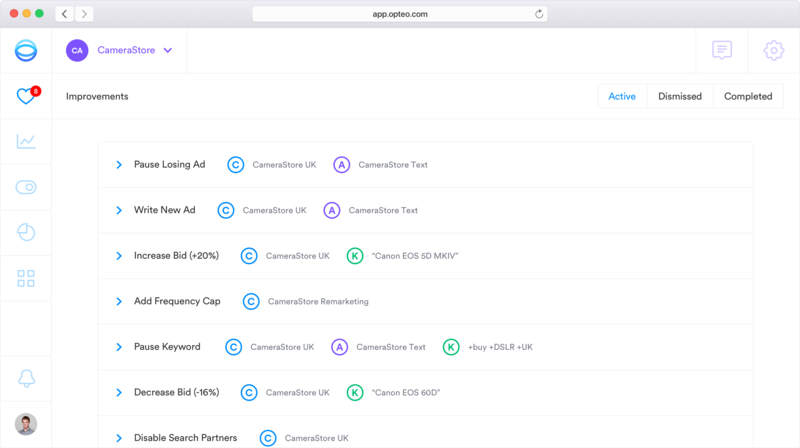 Opteo continuously monitors AdWords accounts for statistically significant patterns. When something important comes up, Opteo suggests an improvement backed up by real data. 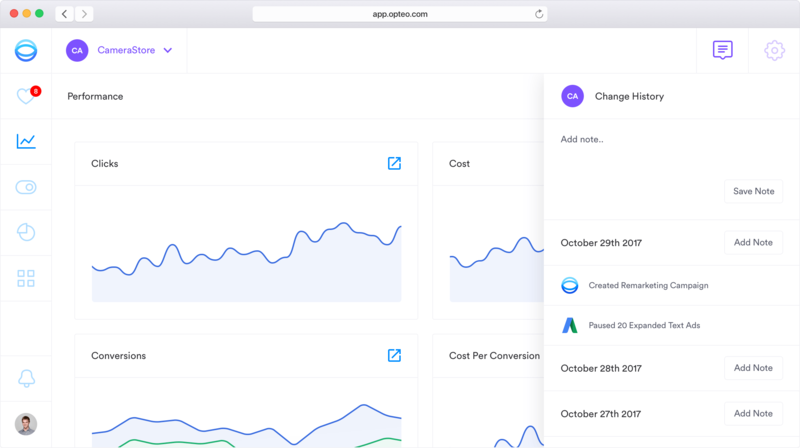 Opteo also includes a set of tools to help you manage accounts, monitor performance, browse segments, track budgets, and get alerts when important changes happen. Optimize account performance with data-driven improvements. 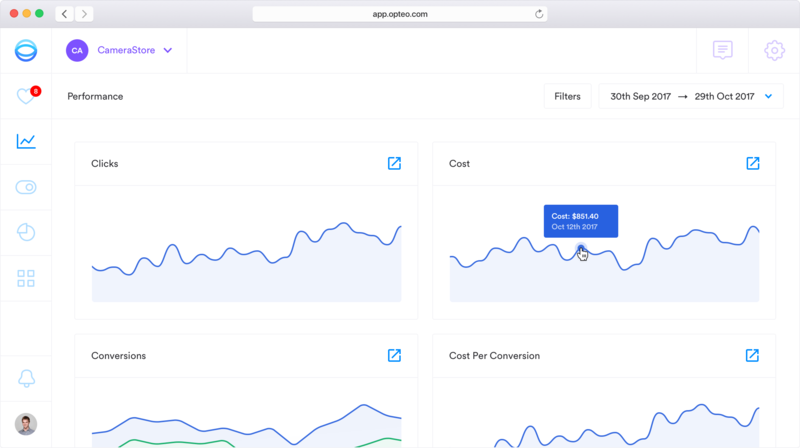 Opteo proposes improvements based on your conversion data and performance targets. 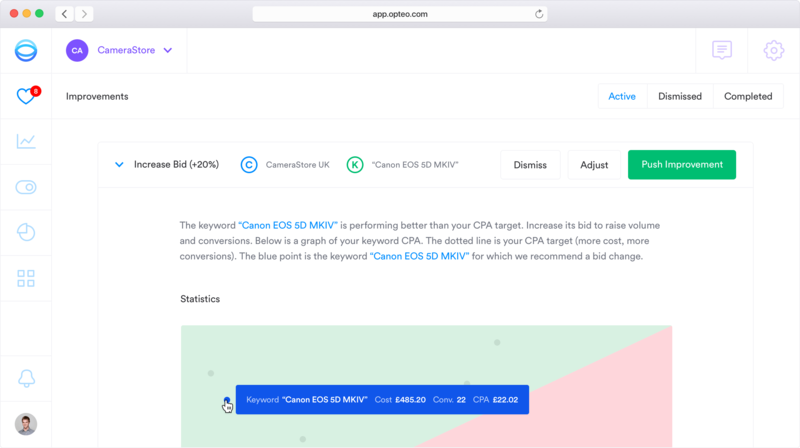 Push improvements live to AdWords in one click. Monitor and diagnose performance issues accurately. In real time. View all key performance metrics in one location. Get additional metrics not available in AdWords (including QS Components, AdRank and more). Control budgets and manage accounts. From Campaign to Keyword. 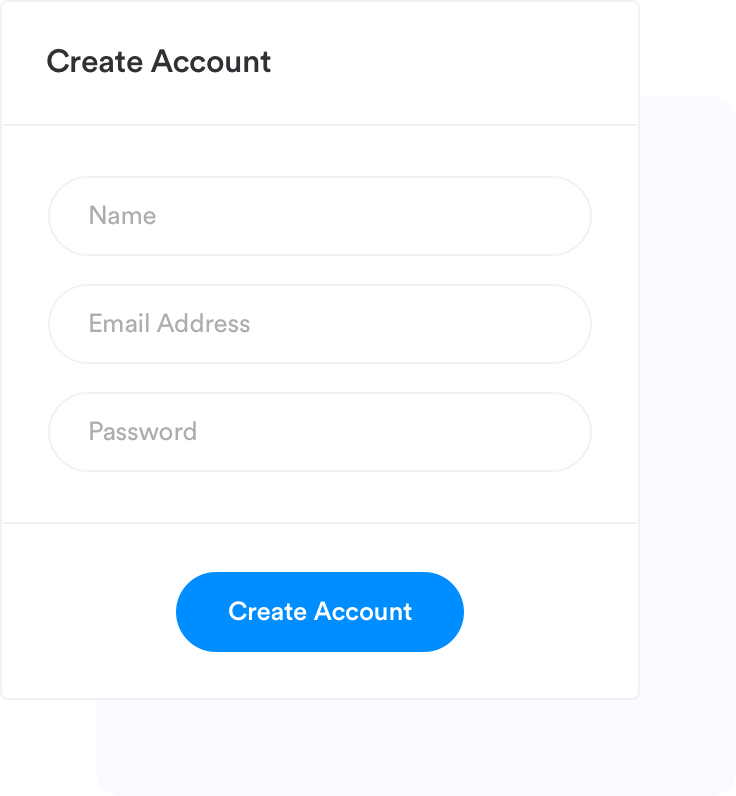 Manage accounts in one unified table. Drill down to view adgroups, keywords, and other components. 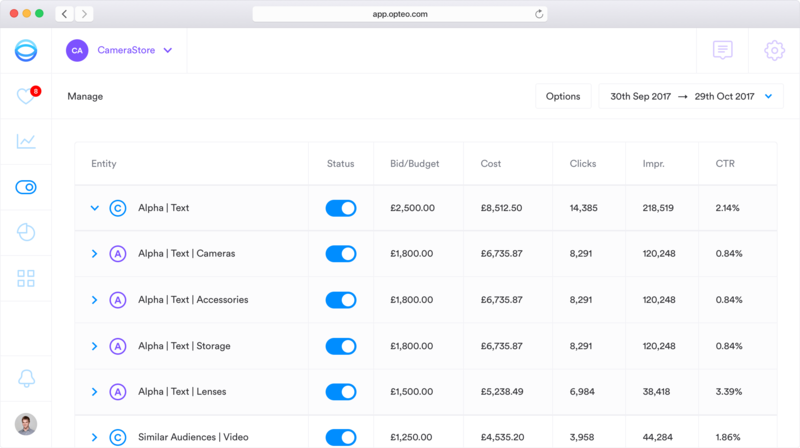 Get complete control over bids and budgets. Forget the days of tireless spreadsheet analysis, pivot tables, and developer scripts. 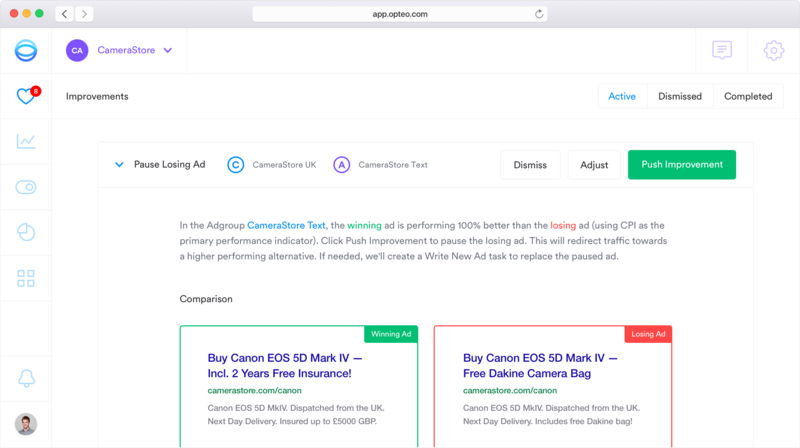 Opteo automatically analyses performance data, search terms, keywords, and bids to generate improvements backed up by real data. With Opteo, managing AdWords accounts is simple, smart and efficient. 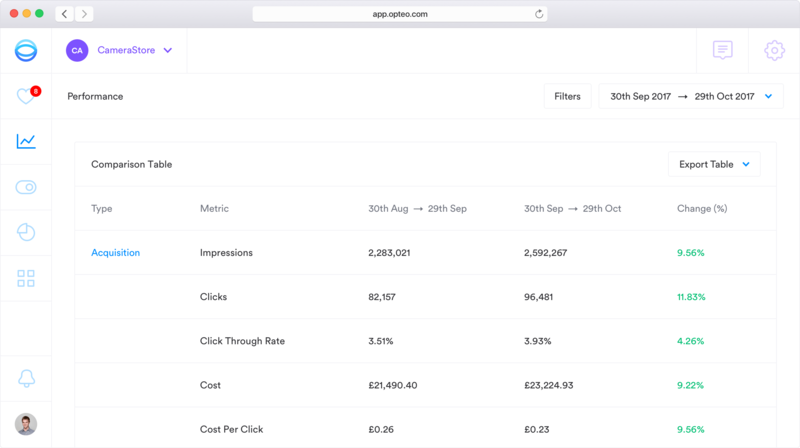 Allocate budget to high performing ads using smart statistical analysis based on Click Through Rate and Conversions. Reduce wasted budget, increase spend on high performing segments. Ensure that keyword bids reflect performance. Be automatically alerted whenever one of your landing pages has a technical problem. Never miss another 404 error. Display ads in profitable places. Optimize display targeting and refine ad creative to fully leverage the Display Network. Automatically set up Single Keyword AdGroups. Fix keyword duplication, cannibalization, and other structural issues. Mine and semantically analyze your search term reports to uncover key negatives and keyword expansion themes. 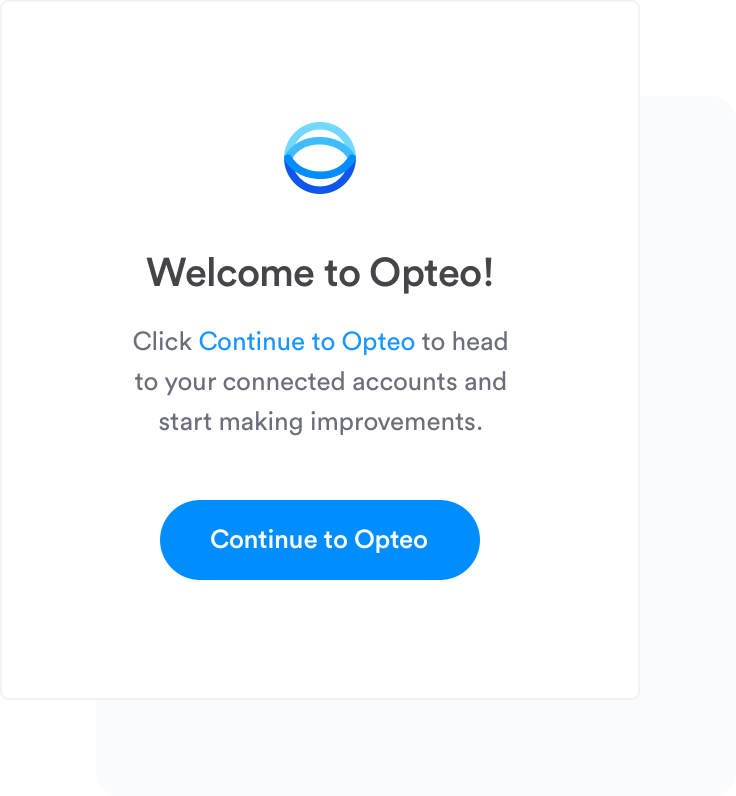 Get started with Opteo in three simple steps. Select a plan and create an account using our sign-up flow. All we need is your name, email address, and a secure password. When you've finished creating your account, you'll be asked to connect your AdWords MCC by signing in with Google. 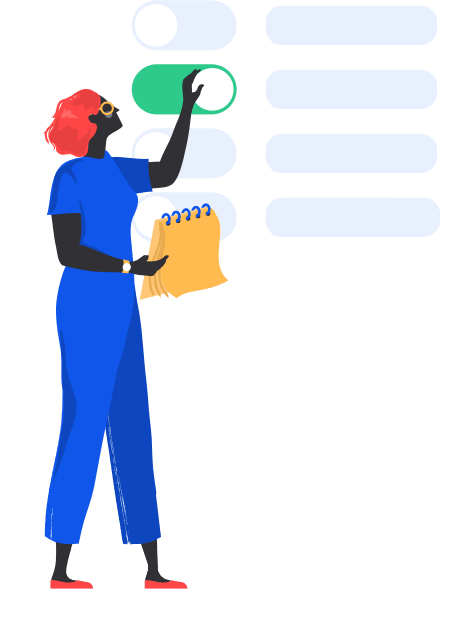 Our algorithm searches your accounts for inefficiences and opportunities, generating ready-to-push improvements in seconds. I'm really happy with Opteo. 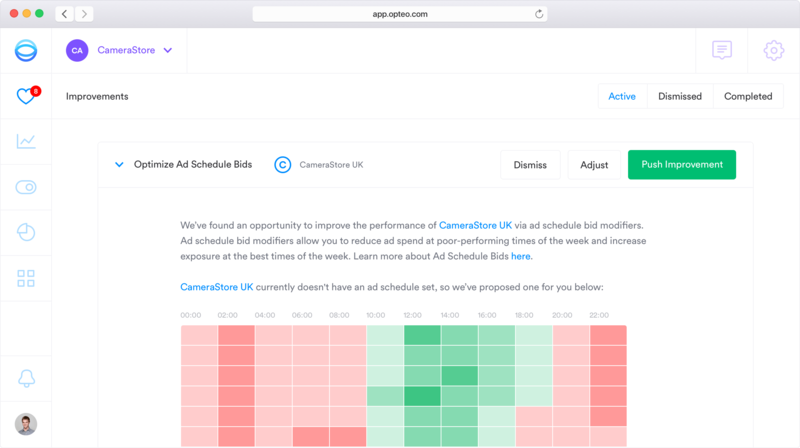 Saves me a massive amount of time and the insights have helped to streamline our campaigns. Richard Y. We're on board past the trial. I love waking up, checking my list of tasks, and it's done. That's it. Thanks for everything guys! Aaron R. The tool is fantastic and really saves me a lot of time in campaign management. Love the new display campaign improvements. Juan C.P. Opteo is exactly what I was looking for, it’s streamlined my daily workload significantly. Easily saves me hours every week. Jacques V.W. Just took a client account which I already considered well optimized from $100+ CPA to $50 CPA in a couple of months! Brian H. Opteo has allowed us to focus on writing better ads, rather than trawling through an endless supply of numbers. Duncan P. Opteo is awesome — I would recommend it to any PPC specialist I know. Chelsea D. Opteo is one of the tools we use to manage AdWords. It's always on point and helps us produce amazing results for our clients. Chris S. You guys have a rad product!!! Adam S. There's nothing like service that makes you feel valued. It's like talking to a friend when I message support with questions! Duncan P.
Headquartered in London, our team is composed of passionate AdWords experts, developers and designers. We strive to provide the edge Adwords agencies need to be successful. We're available to answer questions and provide technical assistance from Monday to Friday (09:00 to 18:00 GMT). Contact support using the chat box below, or email support@opteo.com. 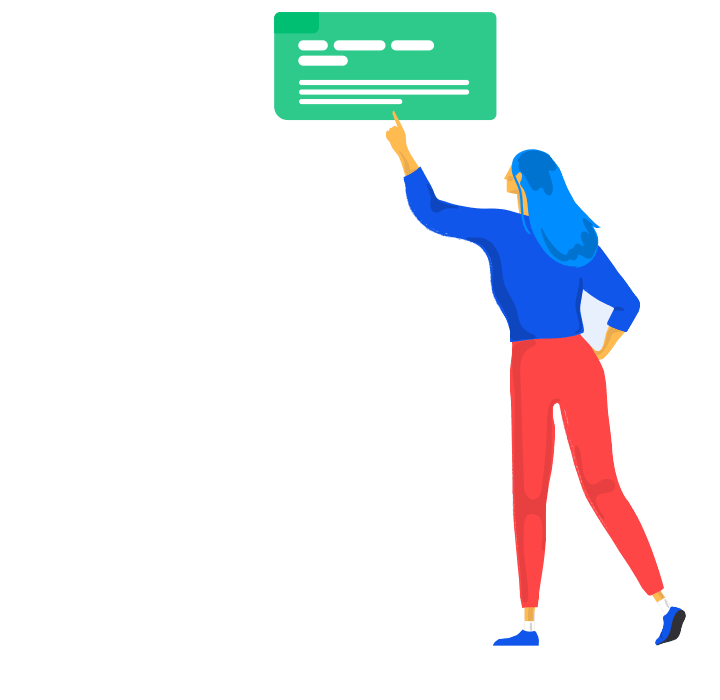 We regularly post articles, guides and tutorials covering Adwords strategy, Opteo tips, and plenty of other interesting things. Visit our blog or the Opteo Adwords Knowledgebase to learn more. For enquiries relating to Opteo, potential partnerships or other business related enquiries, send an email to support@opteo.com or call us on 020 3950 6249. © Opteo, 2017-18. All rights reserved.